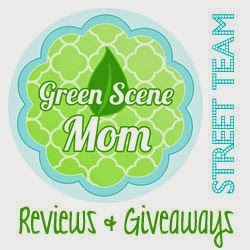 Today's review is a great and a product that all of you moms are sure to have heard of. 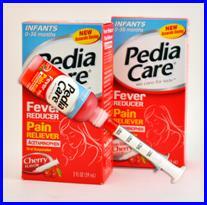 Its PediaCare infant and children's fever reducer/pain reliever. I was sent both the infant version and the childrens. I love this brand since another brand that I wont mention keeps having recalls on their products I have opted out from buying that brand anymore. I am so glad that I have had the opportunity to try out this brand of products. What I love the most is their amazing changes they have made to the liquid acetaminophen products. They worked with Dr. Jim Sears, co-host of The Doctors, on an educational video to help explain the changes. Acetaminophen is one of the most commonly used pain and fever relievers for infants and children and is safe and effective when used as directed. 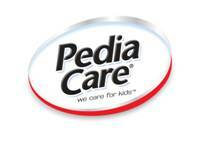 Now, dosing has been made even easier for parents and safer for children as the new PediaCare® and Little Remedies®single-concentration acetaminophen products hit store shelves. But what does this mean for parents? Two of the leading children’s pain relievers, PediaCare® and Little Remedies®, will also offer additional product enhancements, including age-appropriate dosing devices. Infant products will now contain a special dosing syringe and flow restrictors on the bottles; children’s products, for ages 2 to 11 years, will have the bottles with flow restrictors, and continue to contain dosing cups. Both infant and children’s formulations will continue to have weight-based instructions on the package, as well. While the new single-concentration for PediaCare® and Little Fevers® infants’ and children’s acetaminophen products will be among the first to hit store shelves, parents should know that there will be a "transition period" during which the existing infant products and the new acetaminophen infant PediaCare® and Little Fevers® products may be on store shelves simultaneously. The new infants’ formula is less concentrated and the dose is therefore more than in the older infant formulation. And while reading and following package directions is always recommended to obtain accurate dosing instructions, it will be important, while the two concentrations are available, to select the dose that is proper for the specific product version that is being given. Parents and caregivers should ask a healthcare professional if they have any questions. The voluntary changes to single-concentration acetaminophen dosing demonstrate the continued commitment to accuracy, safety and innovation from PediaCare® and Little Remedies®. • Suggested retail price for a 2-ounce liquid bottle is $6.99. • Suggested retail price for a 4-ounce liquid bottle is $7.59. I acutally just tried out the childrens last night Brendan wasn't feeling food and i was very impressed with the new packaging. With the new flow restrictions there is no spilling and less waste and I keep more product in the bottle. Brendan also said the cherry flavor taste was great! I will be using this brand of Pedicare from now on. Now on to the giveaway! An infant will get the same amount as the children's dosage. I've never thought about offering a popcicle after giving meds. That should help in te future for sure. I love the new flow restrictions and easy dispensing! I like that there isn't a concentrated formula any more.